Gears of War 3, Go for the Gold! 2 Comments on Gears of War 3, Go for the Gold! 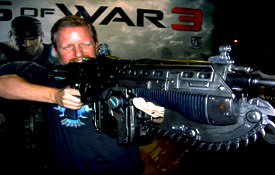 Rod Fergusson announced in a live web broadcast over at Twitch.tv how to get the gold weapons unlocked in Gears of War 3 releasing on September 20th. There are several ways to get all the weapons unlocked and I will try to list them all for you to get crackin on that sweet, sweet gold! Gold Nasher unlock can only be gotten by Veteran Gears from Gears of War 2…BUT! 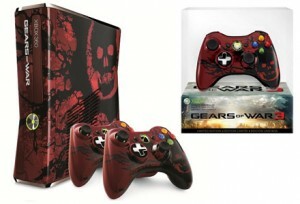 If you plan on buying Gears 3 the first week and playing online then you will automatically unlock it! BUT only if you play online in the FIRST WEEK! You will also unlock a special medal if you are a Veteran Gear from Gears 2 that you can “wear” in gears to let everyone know who you are! It was also announced that starting this weekend August 20th there will be an EXP weekend every weekend until launch. Rod didn’t say what the multipliers would be for each weekend but hinted that they would increase from week to week. So if you haven’t hit level 100 yet, here’s your chance to work on that so you too can get the GOLD! He mentioned as well that if you buy the Gears of War 3 themed controller OR console you will receive the Infected Weapon skin for all 5 weapons which from his description is an animated skin that “glows and pulsates”! The Final announcement was that if you don’t have gears of War or Gears of War 2 that they will be on sale for Digital Download on XBL starting august 23rd in the US, UK and Canada only. HOW DO YOU GET ALL OF THE GOLDEN WEAPENS!!!! !